The tenth edition of the Handbook of Public Relations has just been published. Since the first publication in 1982 by co-authors Chris Skinner and Llew Von Essen, 80 000 copies have been sold throughout southern Africa. Subsequent editions involved Professor Gary Mersham and Sej Motau and, for the latest edition, Rene Benecke. It is one of the longest running publishing ventures of its kind involving four different publishers in its history. The most recent publisher of this title is Oxford University Press Southern Africa (OUP), who has managed the last six editions. First of all, find out what type of content the publisher publishes. What is their focus? For example, at Oxford University Press Southern Africa they publish educational books for learners and students of all ages. Their books can be divided into four categories: schools; higher education, including prescription titles; general interest and reference – including dictionaries. They publish primarily for southern African learners and students. Other publishers will be able to provide you with a similar breakdown of their focus and interest and this information will be available on their individual websites. In order to evaluate a proposal effectively, it is important that you provide the publisher with information about yourself as well as information about the book you would like them to publish. This information is critical and enables the publisher to reach a decision on whether or not to publish your book. First and foremost, who is your audience or target market? Be as specific as possible. In the case of the Handbook of Public Relations, the target market primarily consists of students studying public relations, communications and marketing. However, individuals handling corporate communications, public relations and marketing also represent an important business market for these types of books. Why will this audience or target market choose to buy your book specifically? What is the unique selling point (USP) of your book? Publishing is a competitive business so knowing your USP and developing this, in a unique manner, is very important. What or who is your competition? In other words, what other books are available on this subject matter, and particularly, in the southern African market? It is important to monitor what local and overseas books are available. Although there have been competitive titles published locally on the subject matter of Public Relations, they have focused on specific aspects of the market such as corporate communications, corporate social investment (CSI), promotions and event management. There is also no shortage of excellent overseas publications in this subject matter, but we believe the strength of the Handbook of Public Relations has been its southern African focus, illustrated with a variety of local case studies. What makes your book better than any of these competing books? Endorsements from people in the industry are important, as are recommendations and prescriptions of the text by academics who teach the subject. Very important, from an economic perspective, is how many people you think will buy your book. How big is the target market? Does it run into the hundreds, or thousands, and is the market expanding or contracting? This depends to a large extent on the popularity of the subject. Where will purchasers be able to buy your book? 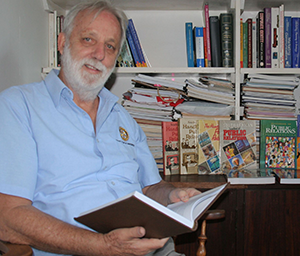 Retail outlets such as bookshops are important, but increasingly books are being purchased online through outlets such as Amazon and Kalahari.com. E books are also now being produced and this should boost the market even further. Finally, will people continue to buy your book for several years to come? The most successful books don’t go out of date quickly. That perhaps, is the greatest challenge facing authors. In the case of the Handbook of Public Relations we have successfully managed a three year publishing cycle, bringing out a new edition to reflect important developments in the profession. Thanks to a very professional team at Oxford University Press Southern Africa, we have managed to keep abreast of dynamic and far-reaching changes in the industry. A covering letter outlining the proposed market for the book as explained above. The rest they say is in the hands of the gods. Our own adventure has spanned some 30 years and there is never a happier moment than receiving the first copy of a new edition. It seems all those long months of detailed preparation are over and you savour the moment, the excitement and the fulfillment of a job well done. *Originally written for Communika, October 2013.